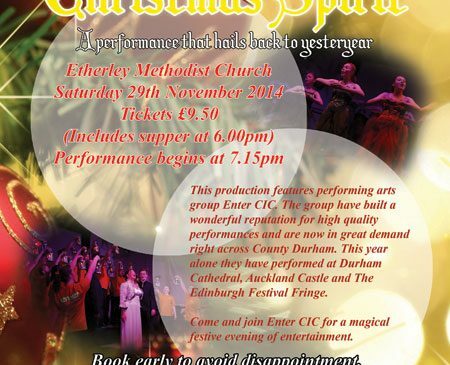 On Saturday 29th November 2014 our students provided the community of Etherley with a magical Christmas Spirit performance. A full house at Etherley Methodist Church witnessed a fantastic show from some of Enter CIC’s amazing talents. We were delighted to welcome new friends on a night to celebrate the start of Christmas. The evening featured an array of songs from our very popular repertoire including an acapella version of the sacred Christmas Carol ‘Gaudete’ and a fantastic rendition of the classic ‘White Christmas’. The audience were blown away with the young people both on and off stage, many commenting on their professionalism. It has been another fantastic year for Enter CIC. Our students have performed at some amazing venues including Durham Cathedral, Auckland Castle, Sage Gateshead and The Edinburgh Festival Fringe to name a few. Our students just go from strength to strength and we are very proud of all they have achieved. We would like to thank Etherley Methodist Church for inviting us to perform and allowing us to provide this opportunity at their venue. It was a lovely evening enjoyed by all. Take a look at some of the comments we received below.